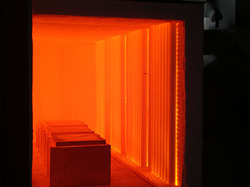 A bogie hearth furnace is the most widely used batch type furnace for heating and heat treatment of a variety of metallic and non-metallic products. 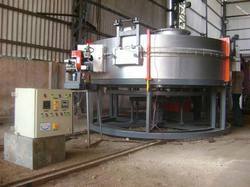 We Offer Bogie Hearth Furnace manufactured using premium quality components and latest technology. We are well known trader and supplier of Bogie Hearth Furnace which are used for: Annealing, Hardening, Stress relieving, Tempering, etc. These applications are related to different grades of Steels in form of castings, forgings, fabricated components, etc. Bogie hearth furnaces are used for annealing, normalising, tempering & solution annealing of large parts & welded constructions. 2. TYPE OF BOGI DRIVE:- Mechanical or Hydraulic.